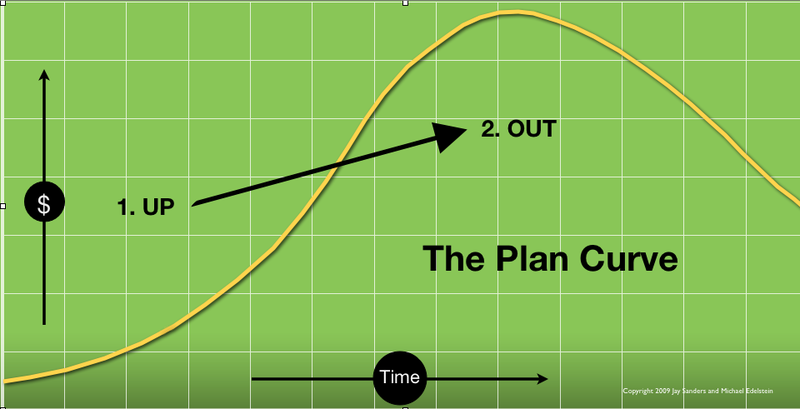 In my posts on the Curve and it’s components I talk a lot about “the top of the curve,” the point where the curve begins moving down and to the right. In personal finance terms it’s the time we no longer can or want to work. It’s the point where we begin living off of our savings, social security and pensions. It’s a number which represents how much money you’ve put away or should have put away by that date. I want to share with you a simple rule of thumb to calculate your top of the curve developed by Bill Bengen a financial planner from El Cajon, California. You may have heard of it as it’s commonly referred to as “the 4% rule.” Here’s how it works, you estimate how much money you’ll need a year in retirement minus your expected social security and pension income. You then divide that amount by 4%, which is the same as multiplying by 25 to get your answer. Quick example, after social security I estimate I’ll need $30,000 per year to live. I multiply $30,000 by 25 which comes to $750,000. For the first year in retirement take out 4% of your total savings or $30,000 ($750,000 x .04). In year 2 you multiply the $30,000 by 1 plus the inflation rate to determine the distribution. If inflation is 3% you would take out $30,900 ($30,000 x 1.03) in year two. And so on for each and every following year. In year 3 if inflation were still 3% your distribution would be $31,827 ($30,900 x 1.03). Bengen developed “the 4% rule ” in trying to quantify an answer to the question of how long investment portfolios, have survived historically once they go into distribution phase. He posed the following question “what’s the maximum initial withdrawal rate protected against inflation for a 65-year-old who expects to live 30 years in retirement.” The research was based on actual market returns and inflation from 1929 forward in 30 year rolling periods. Rolling periods mean 1929 – 1959 is one period, while 1930 to 1960 is another and so on. His original work concluded that the rate was 4%, or in every rolling period he tested a 4% initial distribution subsequently adjusted for inflation always lasted at least 30 years. The portfolio tested had a 50/50 stock/bond allocation. Check out Bengen in his own words. 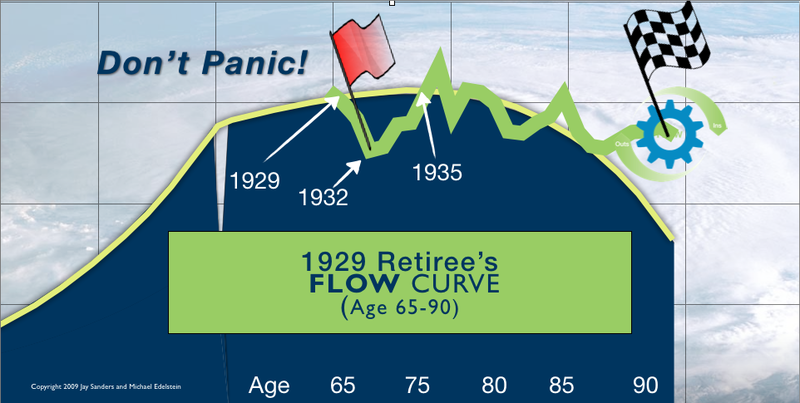 Arguably the 29 crash was the worst in our financial history and so the perfect test for “the 4% rule.” In the image below we’ve superimposed the flow of Bengen’s 1929 retiree on the curve to make the case. You’ll note by sticking to the plan, see far right, that retiree ended way above the curve. This entry was posted in ABCs of The Curve, Financial Literacy Basics, Personal #s and tagged Financial Literacy, Financial Planning, Money Management, Personal Finance, Retirement Planning. Bookmark the permalink.